It's kind of neat knowing where Ottawa's light-rail tunnel, now known so glamorously as the Downtown Ottawa Transit Tunnel, will run whenever the shovels eventually turn up soil. A few months ago, the City announced that a study was underway and that several tunnel options were being considered for station locations. We knew that there would be five stations, and generally where the tunnel would begin and end, but the downtown stations in particular could have been built [PDF] at one of Sparks, Queen, Albert, or Slater streets. Today, City staff recommended where to build those stations. [The tunnel] will start on the downtown edge of Lebreton Flats, roughly at Albert Street, run under the road to roughly Kent Street, then angle northward and cross downtown under streets and buildings and under Confederation Square. It will then go under the canal to roughly Rideau Street and Sussex Drive, then loop south under more streets and buildings before lining up under Nicholas Street, passing the University of Ottawa campus before popping back to the surface on the existing transitway near Lees Station. And where will the stations be? One will be above ground on Lebreton Flats. The four other stations will be underground between Bay and Lyon streets, O’Connor and Metcalfe streets, near Rideau Street and Sussex Drive, and at the university. The stations will have platforms in the centre with rail lines running on either side of them, the note says. If the city can get the federal government to sell them Union Station back, then perhaps it can be reopened to trains; albeit a very different kind from what once went through there. Interesting concept. The feds currently use the building as a conference centre, but all the main elements of a transit station are there (you can check it out during Doors Open Ottawa this year and see for yourself). 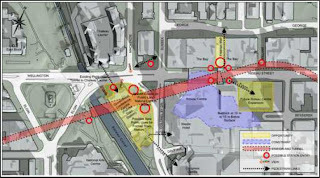 UPDATE: Further to Dave's idea, check out this map from the briefing to council. Evidently, building a station directly underneath the Government Conference Centre was a consideration. The one thing that is interesting from the Citizen story is how the Mayor seems sure that the Feds and Prov will ante up the cash in the summer. My guess is they will as well because the optics of the project (light rail, efficiencies in congestion relief) are good, but also not supporting the Ottawa project while throwing billions at Toronto's rail expansion wouldn't look so fair. and the purpose of the public consultation was what? why did we even spend the money? name one thing that changed. Why don't they built a tramway line instead? Comments, folks! We want to hear from you! but also not supporting the Ottawa project while throwing billions at Toronto's rail expansion wouldn't look so fair.That never stopped the provincial government in previous decades, which funnelled way more money into GTA transit than Ottawa or the mid-sized cities.